Pictured above is a little piece of a hopefully sweet weekend (now if I win my office Oscar pool jackpot…). Like most people, I presume, weekends are the time for me when some good cooking/baking can get under the belt. I have the leisure to wander the fruit/ veggie stands, fight for a spot at the butcher and joke with the fish monger about freshness. If it’s really cold outside a soup will be made and stored away for the week to come. If it’s mild enough to take my time shopping (no car), I have the opportunity to really let my mind wander, without worrying about exposed fingers falling off from the cold. It is some of the worst days though, when the last thing I desire is to step outside. Not even my thick flannel pants I wear camping in the fall or my warmest sweater and thick mittens can convince me into the icy voyage. It is these days where the cookbook is a dear friend and a minimalist “whatever’s in the cabinet” recipe comes to the rescue. It was on one of these bitter days that I picked up one of my new cookbooks and gave it a go. That being said, my initial plunge into this book’s recipes have been extremely rewarding with many more to come. The first challenge was honey-lime truffles. These truffles were an absolute surprise-- who knew I could make such delicious truffles? They were silken and luxurious, sweet and sour and a true Valentine treat. The above pictured specimen was the next step with this book. I was looking more for a bread, but as I said, it was cold outside. I had to stick with what I had in the cabinets. The dates were a recent birthday gift, I was good to go. D is a huge fan of cinnamon rolls. Mind you, not the ones that drip with a sugary white glaze, but straight up cinnamon rolls, raisins optional. They are the ones where the deep twisted chasms are filled with gooey spice and the bread is dense, yet sponge-like in a perfect marriage. In fact, D considers me quite the curmudgeon because I refuse to let him have one every day. If I delight him with a purchase there is usually a portion of a follow up conversation that goes something like: “you never let me have the things that I love,” while cinnamon-sugar oozes between his fingers and sticks to his beard he’ll claim “I’m just saving some for later,” instead of wiping himself clean. I am a cruel person. 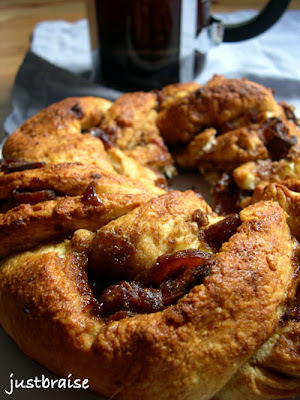 When I saw this recipe for cinnamon date bread I knew it was the perfect merge of D’s love (cinnamon rolls), ingredients (all on hand in the cabinet) and my favorite (the use of liquor in cooking). The perfect breakfast. While my final version is not nearly as clean looking as the version pictured in The Cook’s Book, I can only assume that it is far better in sweet gooey purity. Below is the recipe as it appears in the book. Serving Size= 1 bread; 4 people. Active time= about 30 minutes. Cook time= 30 minutes. 1) Preheat oven to 400F. Thickly butter an 8-½ in ring mold that is 2 in deep, or a cake pan of the same diameter. Line the bottom of the mold or pan with parchment paper. 2) Sift the flour, sugar, and baking powder into a bowl. Rub in the butter using your fingertips. Whisk the eggs with the milk in a cup until well combined, then stir this into the dry ingredients in the bowl. Work the mixture together well with your hands until you have an evenly mixed, soft dough. Scrape the dough out onto a floured work surface and lightly knead it for 10-15 seconds. 3) Mix together the brown sugar, dates butter and cinnamon and rum in a small bowl; keep to one side. Roll out the dough to a rectangle that is roughly ¼ in thick, 14 in long and 8 in wide. 4) Spread the date mixture evenly over the surface of the dough, then roll it up tightly like a jelly roll. With a sharp knife, cut the rolled dough in half lengthwise. 5) Twist the two pieces together, keeping the cut surfaces facing up, then curl into the mold. Bake in the middle of the oven for about 30 minutes. Let the coffee cake cool in the mold for 5 minutes, then unmold onto a wire rack. This is best served still warm. For the Chinese New Year of the Pig I’ll be finishing out my pork dishes. This luxurious soup was made from that citrus-sweet pork shoulder way back when. (This blog is not exactly in Real Time-- although I suppose it is possible I froze the bone). The weather this past week has been frigid. Growing up in the Chicagoland area, I can handle the cold (my school was once canceled because it was too cold to go outside, i.e. frostbite in under 1 second). When I first moved to New York City almost 10 years ago I used to (for brief stints outside) wear t-shirts in 30 degree weather. People thought I was crazy, I proclaimed it was the Chicagoan in me keeping me warm. But when winds blast exposed skin so it feels as though it is peeling right off your face… Well, that makes we want to crawl into a small room with a blazing fire and never leave. When it is this cold outside and you can feel the cold shoot from the pavement through your shoes and freeze your bones, hot meals are all the more soothing. There is little better than the natural heating power of a steaming bowl of soup to keep you toasty (okay, maybe a steaming mug of hot cocoa or tea). This a the perfect soup for the blah weather. It is silky rich and deliciously filling with a little croute on top or crispy bread on the side. My freezer is full of frozen individual portion sizes of soups. Once frozen and mixed up, they often turn into a game of surprise lunches that D and I will regale in after work: “Ooooh, I had that swiss chard soup from this summer-- even better warm!” or “I thought it was the ginger carrot, but once hot I realized it was the winter squash.” The supply sometimes seems endless and the addition of this split pea is a welcomed one. How else do you think D and I have had nary a sneeze these past two winters (forgetting the recent bout of food poisoning that just reinforces the benefits of home eating). 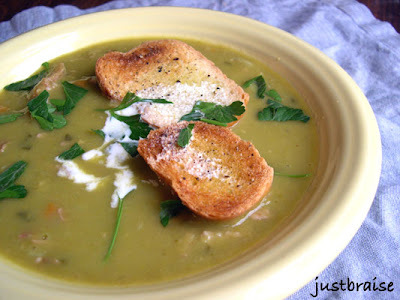 I remember my mother used to make split pea for us in the winter. Just before serving she would float hot dog slices into the soup (how very Chicago of her). As kids, we loved it and I distinctly remember plucking each hot dog piece out with my fingers and shoving my whole fist happily into my mouth, licking it clean in the process. These days, I don’t need that extra salty kick of a hot dog to eat this soup (I prefer the kick of a little bacon). Once the split peas soften into the broth, this soup is deceivingly thick. If I didn’t make it myself I would swear there was gallons of cream laced into this creation. In fact, the only cream is the (optional) tablespoon I floated on top before serving. This is the kind of soup that can melt you out of the warm house, allowing you to brave the nasty elements outside. It is filling on its own, paired with a light salad or a good sandwich. Serving Size= 8-10. Active time= about 20 minutes. Inactive time= about 2 hours. 1) Warm a large stock pot over medium-high heat. Add bacon and cook until browned, about 8 minutes. Remove bacon set aside. Keep about 2 tablespoons of fat in the stock pot, discard the remaining, soaking it up with a paper towel. (If not using bacon, warm the butter and olive oil and continue). 2) Add onion and sauté until translucent; about 5 minutes. 5) Add celery, carrots and pork bone, sauté about 5 minutes. Add water, cover and bring to a boil. Reduce heat to medium and uncover slightly. 6) Let simmer until pork bone begins to break down and smell infiltrates the air, about 1-½ hours. Add split peas, parsley, cumin and pepper. Follow directions for cooking length on back of package, usually the peas need about 30 minutes to cook. 7) Peas will have absorbed most liquid. Add salt to taste. Remove bone and cut any remaining pork into bite-sized pieces, add to soup. Additionally, if any pork remains uneaten from shoulder, about 2 cups of bite-sized pieces can be added to the pot. Add bacon, stir until evenly combined. 9) Serve plain or with croutes and a little heavy cream and/or parsley flakes drizzled over top. Here's another piece I wrote, and an event at that! I'll be there chowing down on Sunday... Come on out, especially if you have Monday off! If you live in Queens head to your local supermarket (or street corner news box) and pick up a free copy of the Queens Chronicle (Western Queens edition). The piece is in the Entertainment section (qboro): Pork Fest in Astoria This Weekend! Queens Chronicle "Astoria Pigs Out". It's getting to the last hours, do you know how you'll be spending your Valentine's Day? If I had a fireplace mine would be spent in front of a roaring fire. Rather, that's how I would spend every night if I had a fireplace. If you're without fire, there are plenty of other options for this day of Hallmark-forced romance. I discussed many in this piece printed in the Queens Chronicle. While your best bets are to keep the eats of the day light and healthy, who doesn’t love a little sugar high? 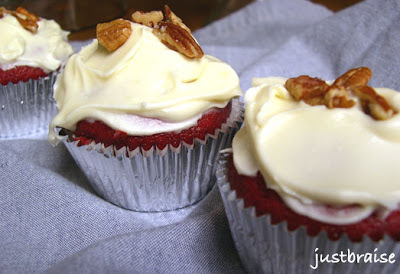 I had my first bite of the sweet seductress known as Red Velvet a few years ago. A yellow cake with a hint of cocoa and a strikingly white exterior, the cake won my heart from the first beat. I could soon be found getting my individual servings of Red Velvet cupcakes around town (my favorite are from Billy’s Bakery since they stick with a cream cheese based frosting). A good recap of the red in Red Velvet can be found here, though I would like to amend the fact that baking soda and cocoa powder do still react to form red, it is a mere blush and these days we help our cakes along with a hefty dose of red food coloring. I searched a number of online recipes for Red Velvet cakes and finally found a tried and tested one in Saveur's March 2006 issue. My boss, who swears by her local bakery, The Cake Man, in Brooklyn, will pick up a slice of his Red Velvet almost daily on her way home. Low and behold the recipe in Saveur is based on The Cake Man’s and after some slight tweaking of ingredients on my part, I have come up with a consistency of redness I like and a deliciously seductive cream cheese frosting. This cupcake is sure to win the hearts of many. It is fast and easy to make and creates a perfect last minute cupid’s arrow. Prep time= about 20 minutes. Makes about 18 cupcakes. 1) (Set cream cheese and butter for the frosting aside to soften.) Preheat oven to 350F. Line 18 cupcakes tins with cupcake liners. 2) In a large bowl, sift together flour, sugar, baking soda, cocoa and salt. 3) With an electric mixer, beat eggs, oil, buttermilk, food coloring, vanilla and vinegar together until evenly combined. 4) With the mixer on medium, slowly add dry ingredients to the wet ingredients until smooth, 1-2 minutes. Fill cupcake tins about ¾ full and bake on middle rack 20-25 minutes, until toothpick comes out clean. Remove from tins and cool onracks about 10 minutes. While cooling, make the frosting, below. 1) Beat cream cheese, butter and vanilla in a bowl with an electric mixer until well combined. Add sugar, beat until frosting is fluffy, about 5 minutes. 2) Cover each cupcake with about 1 heaping spoonful of frosting, spread with a knife. Sprinkle pecans over frosting and press in slightly so they stick. If you live in Queens head to your local supermarket (or street corner news box) and pick up a free copy of the Queens Chronicle (Western Queens edition). My story is the cover page of the Entertainment section (qboro); a piece on aphrodisiacs. I notice there are far too many sweets on display on this site. It appears we eat nothing but that sweet angel dust. In the next few days I'll be adding all the delicious porky creations made from the one 6 pound shoulder discussed below. The first post-roast creation was a delicious sandwich that had no chance at a photograph. Served on hearty Jewish rye bread (any offended excuse the sac-religious combination), Korean pears ( mentioned here ) and a generous smothering of honey mustard. A few minutes in the toaster oven set this to a perfect sweet-crisp combination. Another hog-a-licious idea was to be pulled pork sandwiches smothered in a hickory BBQ sauce. Instead, we mixed the pork with avocado, lime juice and tomatoes and wrapped them in the tortillas that remained after the pork tacos pictured above. Similar to the tacos, yet a totally new flavor combination and equally delicious. 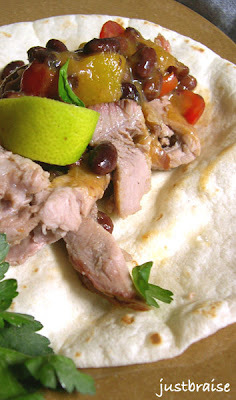 The pork tacos appearing above are served with a healthy scoop of a black bean mango salsa and a dusting of cilantro. They compete with the chorizo taco from my favorite taco truck down the street. It goes to show you can eat well on a budget and create a symphony of tastes with the result. There are plenty of dishes that were not created that would be just as delicious: pork fried rice, rice and beans, breakfast hash, hammy macaroni, a number of soups (a rich split pea to come), empanadas, pork dumplings or piradzini (Latvian pork puffs, also to come). A $20 pork shoulder can take two people far. This black bean mango salsa is a great summertime side. It is great with the addition of corn and can be used for a number of taco combinations, my favorite being a grilled shrimp. Prep time= about 10 minutes. 1) Slice the mango and put it into a medium-sized bowl. The meat surrounding the pit can be squeezed into the bowl. Add lime juice, chopped onion, black beans, corn, tomatoes and cilantro. Stir and serve.